Author's Note: This letter was written in response to an article by the American historian Thomas Sakmyster on the case of John Lautner, an Hungarian-American Communist functionary kidnapped and brutalized by U.S. Communists during the Soviet-directed purges in East Europe after the second world war. Regarding the excellent account by Prof. Thomas Sakmyster of the John Lautner case, in the December 2010 issue of American Communist History, vol. 9 (3), I note mention of the Hungarian Communist Sándor Cseresnyés [Cseresnyés Sándor by Hungarian custom] and his involvement in the Lautner matter. I have compiled a literary/semi-scholarly volume of my articles on Western Balkan Jewish history (mainly Sephardic), titled Sarajevo Rose (London, Saqi Books and The Bosnian Institute, 2005). One of the people about whom I wrote a good deal, based on personal contact and occasional cooperation, is the former president of the Jewish Community of Sarajevo, Ivan (nicknamed Ivica, sometimes Ivo) Čerešnješ. Ivan Čerešnješ is the son of Sándor Cseresnyés. Sándor and his wife, Ivan's mother Eva, went to live in Yugoslavia after 1956. I reproduced his family name, throughout my narrative, with the South Slavic spelling and diacriticals, rather than its Hungarian form, in conformance with Bosnian orthography. Ivan Čerešnješ was a Bosnian who now lives in Israel. Sarajevo Rose also includes a photo of Ivan. At Ivan's request, I examined a significant amount of material about his father, the Hungarians in the International Brigades [during the Spanish Revolution and Civil War of 1936-39], and related matters. I am the coauthor of the only complete book in English on the history of the Partit Obrer d'Unificació Marxista or POUM (Spanish Marxism vs. Soviet Communism: A History of the POUM, with Víctor Alba, New Brunswick, Transaction, 1988) and was also able to include in Sarajevo Rose a brief comment on the 1949 Budapest purge trial of the leading Hungarian Communist László Rajk. At that trial an attempt was made to link Rajk, while he was interned in France after the Spanish civil war, with the well-known ex-anarchist turned Marxist and POUM leader, Enric Adroher i Pascual (1908–87), known in political life as "Gironella." The anti-Jewish intrigues against Rajk and his co-defendants during their trial were striking. Because of his German name (Rajk=Reich), he was Jew-baited by the sitting judge, and finally burst out "I am of Aryan descent, and genuinely too, because on one side I am Saxon," i.e. of German Christian origin. Rajk was executed shortly after the trial. Ivan Čerešnješ left Bosnia for Israel after the Dayton agreement of 1995. He was awarded a rank in the Légion d'Honneur by the French government during the Bosnian conflict. He told me his family were Ashkenazi Jews from Bukovina, whose original name was Kirschner— Cseresnyés is the Hungarian translation of a word, like the German term, derived from "cherry-tree." Some sources state that Sándor Cseresnyés was, however, born in Temesvár or Timişoara in Transylvania. Ashkenazim were a small minority of Bosnian Jews, most of whom were Sephardim who settled there in Ottoman times. Eva Čerešnješ became a well-known figure in the Yugoslav film industry and worked on at least two of the most popular Yugoslav "Partisan" films—Walter Defends Sarajevo (1972), original title Valter Brani Sarajevo, and The Bridge (1969), original title Most. Walter Defends Sarajevo is an exceptionally popular cinema feature about which Bosnians are noticeably nostalgic. Vladimir Perić, alias Walter, was the head of the Tito-led Partisan network inside Sarajevo during the war and the film tells the story of the attempts of the Gestapo to "crack" his identity. I lived in Bosnia after the 1992–1995 war and saw the film on TV several times. The plot is complicated, since there are double and triple agents in it. But the very, very famous last scene shows the Gestapo head and German corps commander on the parapet of the fortress overlooking Sarajevo, and the Gestapo head, with a sweep of his hand, points to the whole city below him and says "Das ist Walter!" The scene is so famous it was turned into a soap commercial after Dayton. Walter Defends Sarajevo has been shown frequently in China, of all places, and a brand of beer was allegedly named after it. I once met, in Sarajevo, an immigrant Chinese lady who said yes, indeed, we all love Walter Defends Sarajevo. Most is one of the best Yugoslav Partisan films, in my esteem, and was produced, earlier, by the same team. 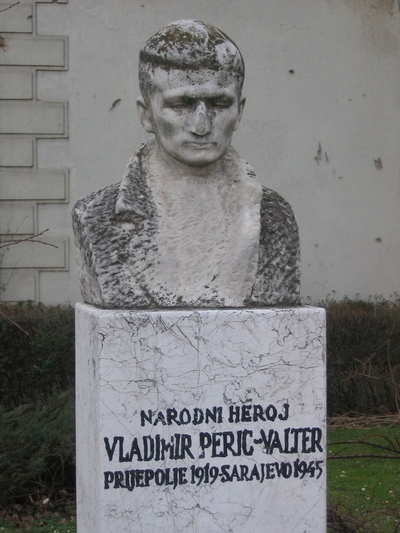 The real Vladimir Perić "Valter" (to use the common form) was killed during the liberation of Sarajevo in 1945, about a block from the Sarajevo house I stayed in during 1999–2001. There is a small bust of him in a very tiny park nearby—an image of it appears on Google. "Valter" is common as a metonym for Sarajevo, and a group of Bosnian journalists, with my support and participation, launched a satirical-political journal in Bosnian with that title in 2000. Unfortunately it was taken over by Islamists, its founder died under mysterious circumstances, and it no longer appears. A real Balkan tale! Regarding Sándor Cseresnyés, his involvement in the Rajk trial and similar matters was ambiguous and disturbing. Sándor Cseresnyés was, according to Ivan, an extremely popular writer for Magyar Jővő (Hungarian Future), an Hungarian language newspaper published in New York by the CP-run International Workers Order, that is less well-known than the periodical mentioned by Prof. Sakmyster, the daily Új Előre (New Forward). Prof. Sakmyster chose not to respond.